Out of a series of terrorist attacks which took place January 16-17, the explosion in Kabul attracted the most attention. Information about the explosion in Lebanon was hardly noticed at all. But the explosion in the Lebanese city of Hermel on January 16, as a result of which five people were killed and dozens were injured, is of great significance in understanding what is happening in Lebanon and Syria. The time for the Hermel bombing was chosen deliberately. On January 16 the first trial of the Special Tribunal for Lebanon (STL) began… The tribunal was created back in May 2007, but until now it has not conducted a single trial. And at that time a warning was heard in the Security Council chamber: the path the UN Security Council has started on in creating a new tribunal will put the Lebanese state, already fragile, in danger of losing its stability. As time has shown, that is exactly what those who strove to create the STL at any cost wanted. The courtroom during the opening of the first trial. 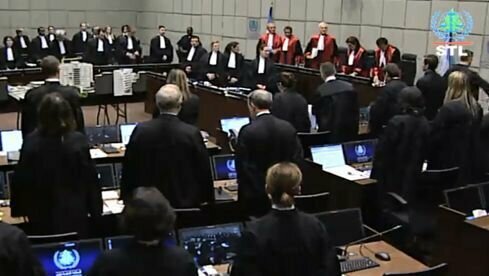 During the live broadcast (1) the camera assiduously avoided showing the empty defendants' bench. The decision to create a Special Tribunal for Lebanon was made by the UN Security Council and the Lebanese government after the assassination of former Prime Minister Rafic Hariri. On February 14, 2005 in Beirut there was an explosion which killed 22 people, including the former prime minister, and injured over two hundred. Formally, the request to the UN for the creation of a Special Tribunal was made by the Lebanese government. However, let us note the date: the request was made only in December 2005, that is, almost a year after the assassination and only after the new leader of the «Future Movement» party, created by the murdered Hariri, became the prime minister. Four other Security Council member states also expressed sharp criticism of the proposed draft. For example, Indonesia stated that the Security Council has no legal grounds for taking the resolution of an issue which is domestic in nature upon itself. (4) The representative from South Africa noted that the UN Security Council has no right to bypass the procedures required by the Lebanese Constitution for the entry into force of an agreement with the United Nations; in disregarding the Lebanese Constitution, the Security was going against its own decision regarding the need to respect the sovereignty, territorial integrity, unity and political independence of Lebanon. This resolution, stated the RSA representative, creates a danger that the imposition of the special tribunal on Lebanon without the consent of all the parties concerned will detrimentally affect the political stability of the already fragile Lebanese State. The representative of China warned of this as well, emphasizing that such a step would create «precedent of Security Council interference in the domestic affairs and legislative independence of a sovereign State». The Special Tribunal for Lebanon is the same kind of unlawful institution as all the similar ones created by the UN Security Council in circumvention of the UN Charter and in clear violation of the very basics of international law. The STL has become the most secretive and the most non-standard of all institutions of this type; even such standards of human rights as those which are formally enshrined in other odious tribunals, such as the International Criminal Tribunal for the Former Yugoslavia or the International Criminal Tribunal for Rwanda, do not apply there. A clear illustration of this is the permission to conduct trials in absentia, that is, without the defendant. Some achievement in the field of human rights that is! It would seem that an interesting courtroom drama is ahead; the only problem with the trial is that the defendants themselves are not there. In connection with this, the attorneys for the defense were not selected by the defendants, but were appointed by the tribunal itself. The attorneys will defend their clients without ever having met them based on documents which they will receive from the prosecution! There couldn't be a better parody of justice! And the judges in the new tribunal? There are 13 judges in the tribunal in all, of which only four are from Lebanon; the rest are so-called «international» judges, more precisely, foreigners representing mainly European countries (Italy, for example, is represented by three judges), although judges from Jamaica and Uganda were added for exoticism. The «Syrian trail» could be seen in the plans of the creators of the Special Tribunal on Lebanon immediately after the events of 2005. Hariri's demands that Syrian troops be withdrawn from Lebanon served as grounds to accuse Syria first of all. In both the materials of the investigative committee for the Hariri case and in the materials of the STL, the first main defendants were Syrians. And the main suspects in the first trial which has just begun are members of Hezbollah. It sounds fantastic, but the prosecution has also never presented any evidence of the defendants' intent. That is, according to the indictment, the assassination was carried out with no intent whatsoever! This isn't even a parody anymore. There's nothing to parody; there has never been anything like this in the history of international justice. There have been farfetched and blatantly falsified motives ascribed to defendants, but to simply say nothing about motives - there's never been anything like that before. Now the beginning of the Special Tribunal for Lebanon's work has been marked by a terrorist attack in Lebanon itself. The reaction of the UN Security Council to this attack was quite curious. Strongly condemning the attack and underlining the need to bring the perpetrators to justice, the members of the Security Council demanded that «all Lebanese parties...respect Lebanon’s policy of disassociation and... refrain from any involvement in the Syrian crisis». As we can see, the main object of interest, Syria, has once again been named, this time without unnecessary explanations. (1) The photograph was made by the author of this article during the live Internet broadcast of the court hearing. (4) The representative of Indonesia further noted that before making a decision on a draft resolution intended to uphold justice, the Council should fully consider the domestic situation in Lebanon, as forceful interference by the UN Security Council in the national constitutional process with regard to the establishment of the tribunal will not serve the greater interests of the Lebanese people: reconciliation, national unity, peace and stability.